Goathland in the North York Moors is a village famous for being Aidensfield in the popular Heartbeat series. 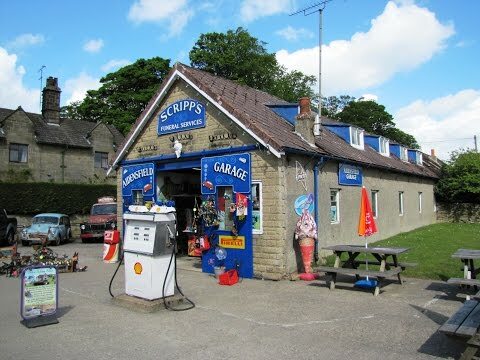 The village store, Scripps garage and funeral services, the Goathland Hotel (Aidensfield Arms), the railway station and many other landmarks are recognisable from the series. Goathland sits in a dip surrounded by hills and beautiful scenery. The owners of the sheep hold common rights so the sheep can roam freely around the village common and the surrounding moorland. Mallyan spout is sixty feet high and is the tallest waterfall in the North York Moors. The waterfall is at its best after a fall of rain or in the winter, early spring before the leaves block the view. The North Yorkshire Moors Railway Station is well worth a visit. The steam and diesel trains run often on this line from Pickering to Whitby during the tourist season, Easter to October, but less frequently in the winter. There are also stations at Levisham, Newtondale and Grosmont so you can disembark and go for a walk or just enjoy the scenery then re-embark back to your destination. Beck Hole is a small, quiet and untouched village only about a mile and a quarter from Goathland. This sleepy village sits at the bottom of two 1-in-4 winding inclines so tourist coaches are unable to reach it but this village was once a thriving ironstone industry, with drift mines, blast furnaces and miners cottages. The Birch Hall Inn, unchanged for many years, has only a tiny bar and an even smaller shop. There is a bench outside the inn which in the summer is a wonderful suntrap. Beck Hole had another pub, now a private house, called The Lord Nelson which closed in 1940. Beck Hole also had a railway station until 1864, when a hauling line snapped and a carriage plunged down the incline, killing two of the occupants. Grosmont is another popular tourist village with the station and the North Yorkshire Moors Railway line going through the centre. Grosmont had an industrial background and the lime kilns and iron workings are still visible. There was an old brickworks too which was excavated in 2007 during work on the railway. The steam and diesel trains are maintained and restored here in the NYMR’s engine shed which can be reached through the pedestrian tunnel at the side of the railway line. There are plenty of seats to sit and relax and watch the trains and the world go by. The old railway line which is now The Rail Trail (3½ miles long) connecting Grosmont to Goathland is the original route of George Stephenson’s railway line of 1836. We park on the grass to the left of Mallyan Spout Hotel and walk down towards Goathland village. We turn right at the junction and walk past the shops, car park, Scripps Garage and the Goathland Hotel and keep heading forward until we come to the station. We cross over the railway line and take the footpath on the left following the fence and the course of the railway. We then go steeply down some steps then head to the footbridge and the buildings in front of us. We turn right over the ford and take the footpath, off the track, on the left which goes over a little bridge, up some steps and then uphill. Near the top we go over the stile and head forward following the footpath passing a house with Goathland and the railway track on our left. We go through a gate and follow the wall on our right. At the end of the wall we follow the lower path until we come to a seat. We bear to the right, pass a farm then we head forward to Hill Farm where there is a caravan park. Here we turn left to the road. The bridge on the left leads to Beck Hole but we follow the road forward until we reach Hollin Garth. We take the bridleway on the left just past Hollin Garth and head forward going through a farm then turn left onto the track then right between two buildings. We walk forward through a field then the path goes between two hedges then we take the path going off to the right going over a footbridge. We follow the footpath with the trees on our right then on our left heading into Crag Cliff Wood. When we come to a ford sign we turn right and go over the bridge and turn left and follow the path to the road at Grosmont. We turn left towards the railway station passing the Station Tavern. Just before the railway crossing we turn left then we take the right footpath going through the tunnel, to take a look at the engine sheds. We then go back through the tunnel and take the footpath on the right, the footpath goes through a gate and we turn right to the top of the hill and the seat. The view of the station below is awesome. We take the track on the left at the back of the seat. We now follow this track, the old railway line, going through the gates and over two footbridges. At the third footbridge (optional) we decide to turn left and walk into the village of Beck Hole to take a look round. We then head back to the bridge and carry on following the railway track for a short way until we come to Incline Cottage. Here we turn right through the gate on the right signposted Mallyan. We follow the footpath which goes through a gate then steeply up some steps then steeply down some steps to a bridge. We go down and over the bridge and follow the footpath until we come to a sign post, Mallyan Spout 130m, we head forward to the Spout clambering over the rocks, please take care here as it can get very slippery. After admiring the waterfall we head back to the signpost and turn right up the steep hill back to Goathland coming out at the side of the Mallyan Spout Hotel. This is a moderate to hard walk with some steep inclines and declines. The old railway track from Grosmont to Goathland is flat and is suitable for wheelchairs and pushchairs. Goathland is near Whitby in the North York Moors. From Pickering on the A170, Thirsk to Scarborough road, take the A169 to Whitby. After passing Lockton on the left and then the Hole of Horcum take the next left for Goathland. Mallyan Spout Hotel is opposite the T-junction. In Goathland there are toilets in the car park and on the station platform and in Grosmont there are also toilets on the station platform. For refreshments in Goathland there are shops and three pubs the Mallyan Spout Hotel, Inn on the Moor and The Goathland Hotel. There is also a Tea Room on the station platform. In Grosmont there is the Station Tavern and a souvenir shop on the station platform and also a Co-op and an art and craft shop on the main street. In Beck Hole there is a shop at the Birch Hall Inn. very useful as I’m planning to go there nex June and I like to know in advance what i’ll see.